Twynam 25A is 3 bedrooms and 2 bathrooms Dog Friendly freestanding house, ideal for your next family holiday. 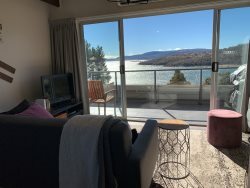 A modern living area on the top floor has a designer kitchen with large walk-in pantry, close by dining area so the cook does not miss out and comfortable living area leads to the deck with great views of the mountains and Lake Jindabyne. A 3 burner BBQ is provided along with comfortable outdoor furniture. Three bedrooms on the lower level, master queen has an ensuite. Large family bathroom, laundry and separate drying room. Off-street parking and a lockup single garage - you don't even have to get out of the car with remote control access and internal house entrance. There is no parking available for minibuses at this property. Twynam 25A has everything you need for a great holiday summer or winter. The home is available as a "dog-friendly" holiday home so bring your K9! There is a small fenced yard good for dogs from Pugs to Labrador's! Please be aware grass can be scarce in our climate and weeds do occur! All Linen Provided. Including our deluxe 'Bath sheets"
Thank you Ray White Jindabyne for a great holiday stay. Rental was clean and had a beautiful view. Thank for your professionalism an friendliness. It was a great place to stay and made our holiday.